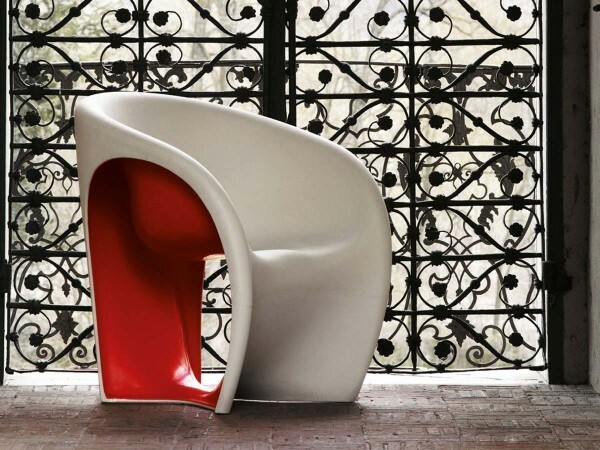 The MT1 chair, designed by Ron Arad for Driade, constructed of rotational molded polyethylene with the bold rocker form. It's an extremely comfortable chair, low maintenance and easy clean up. Indoor or outdoor use. “MT”, the acronym defining this collection designed by Ron Arad, in English is pronounced “empty” that means “vacuum” and emptiness is really the key element of this project. The volume, achieved through a rotational molding, in fact, is hollowed and presents provoctively its interior, finished in different colours. This is possible thanks to a double step in the rotational molding. First of all the polyethylene of the outer shell color is placed in the mold. Once formed this layer, the second color is inserted and adhere to the first without merging the two polymers, even though this process takes place in blast furnaces. Once extracted from the mold, a five-axis laser will cut off the lateral ends of the product, revealing the two-tone side of the MT. From the typological point of view is also reported the presence of a rocking chair, a rarity in the contemporary world. Polyethylene monobloc sand white or grey colored outside and red, lilac, black or violet colored inside. Indoor/outdoor use.